The St. Louis Cardinals' standards are not universal to all teams, so not all teams would be chagrined by the thought of going three straight years without a postseason berth. The Cardinals, though, not long concluded a span in which they were part of the playoff fray 12 times in 16 years. So, yes, three years and counting qualifies as a drought in that context. Infielder Yairo Munoz will likely also be on the active roster when the Cardinals go with a seven-man bullpen, and it's also possible he'll displace O'Neill on the active at some point. Gyorko may also wind up on the DL to start the season, which means Munoz would crack the active. Until Carlos Martinez gets healthy, the fifth spot is open. Hudson is probably the favorite, but Austin Gomber and Daniel Ponce de Leon are also in the running. LHP Brett Cecil and RHP Luke Gregerson will also be in the mix once they're healthy. Last season, the team saw drastically better results after manager Mike Matheny was fired and replaced by then-bench coach Mike Shildt. Tactically, Shildt seems to be a fairly conventional skipper, which means he's a notable upgrade over Matheny. Shildt really shined when it came to improving communication with his players and soothing a clubhouse that had strained and broken under Matheny. To be sure, Shildt isn't some kind of miracle worker or even among the top managers, but the low baseline established by Matheny means that the Cardinals could see substantial gains in the dugout over the course of a full season. Barring the unexpected, Dexter Fowler will open the season as the Cardinals' starting right fielder, as you see above. Fowler is going into the third year of a five-year, $82.5 million contract, and players who make that kind of money tend to get the benefit of the doubt when it comes to playing time. Fowler, though, wasn't healthy in 2018, and when he was healthy he was frankly terrible. Yes, he's at an age at which decline often sets in, but that doesn't fully explain the depths of his 2018. The Cardinals and Fowler of course hope that he'll rebound in 2019. That's possible. Decline isn't linear, especially for good or once-good players like Fowler, and he could see an upward trend on those grounds. He's also supposedly healthy heading into the 2019 season, and there's no doubt that Fowler has a vastly better relationship with Shildt than he did with Matheny. Some of his offseason revelations strongly suggest that his emotional state played a role in his 2018 struggles, which is entirely understandable. But will he rebound enough? The SportsLine Projection Model (@SportsLine on Twitter) tabs Fowler for a 2019 slash line of .216/.304/.374. By comparison the average MLB right fielder last year batted .258/.334/.433. In a division that also houses the Cubs and Brewers, the margins figure to be tight for the Cardinals, and they need to eke out every run scored or run prevented that they can. Can they live with Fowler's possibly below-average production and his declining glove? If not, they'll likely turn to Tyler O'Neill. The 23-year-old O'Neill has tremendous raw power, and the he's reportedly responded quite well to the tutelage of new hitting coach Jeff Albert. At this stage of their respective careers, O'Neill is also a better fielder than Fowler. 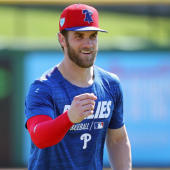 Right now, O'Neill seems likely to crack the roster as a fourth outfielder, but as a right-handed batter backing up an outfield of two righties and one switch-hitter who's better from the right side, he may struggle to find playing time. If that's the case, then O'Neill will likely be optioned to Memphis so that he can get regular reps. So this question has two layers: One, to what extent will Fowler rebound (he almost certainly can't get worse)? And two, if he struggles how soon will Shildt -- who has cultivated a close relationship with Fowler -- turn to O'Neill or some other alternative? It could be a defining dilemma. Matt Carpenter's been toggled around the infield for much of his career. He started out as a second baseman, but concerns about his range pushed him to third, where eventual concerns about his shoulder pushed him to first. Now, at age 33, he's back at third base. Hitters getting into their mid-30s don't typically shift to more demanding positions, and given the extent of Carpenter's shoulder issues it's especially concerning. The spring returns, though, have raised hopes that Carp can handle the unconventional shift. He's reworked his throwing motion, which may serve to make him a better thrower and keep that wing healthy. But will the increased pressure in the field exact a price at the plate? Major-league ballplayers are necessarily good at compartmentalizing, and Carpenter is surely no exception. Whether he can pass muster defensively at the hot corner while remaining a take-and-rake producer at the plate is a vital subplot for the 2019 Cardinals. In 2017, Marcell Ozuna leveled up in what would turn out to be his final season with the Marlins: 37 home runs, an OPS+ of 149, and a Gold Glove and Silver Slugger. It's that power ceiling that prompted the Cardinals to trade for him leading up to the 2018 campaign. Last year, though, Ozuna backslid to 23 home runs and a 106 OPS+. Much of the decline was owing to Ozone's balky shoulder. By the latter part of the season, his throwing arm in left called to mind aging Johnny Damon, so it was bound to have affected him at the plate. This offseason, Ozuna underwent surgery, which raises hopes that he rediscover that 2017 form. As noted above Ozuna is in his walk year, so he has plenty of incentive to put up big numbers. The Cardinals of course need exactly that from their left fielder and more specifically from their left fielder's right shoulder. Carlos Martinez on his best days is the ace of the St. Louis rotation. However, shoulder issues mean he'll open the season on the injured list, and the Cardinals' rotation depth plus Martinez's success in a relief role last season mean he could wind up in the bullpen. In 2018, Martinez returned from an oblique injury in August and landed in the bullpen. Of his 15 relief appearances (he had a 1.47 ERA out of the bullpen last season), five were of the multi-inning variety and nine were save situations. In other words, Shildt's comfortable using him as a "relief ace." We're in an era in which the starter is being deemphasized in favor of the reliever, and a bullpen that features the likes of Jordan Hicks, Andrew Miller, Alex Reyes (see below), and Carlos Martinez is bound to be intriguing for a team with playoff aspirations. If, however, the Martinez-less rotation doesn't perform as expected or stay healthy or if Martinez comes to resist long-term bullpen detail, then the above won't come to pass, at least on lasting basis. The first matter is when Martinez returns. The second is how he returns. Not so long ago, right-hander Alex Reyes was regarded as perhaps the top prospect in all of baseball. He's now 24 years of age, and Tommy John surgery followed by a torn lat have limited him to a total of just 50 big-league innings over the last three seasons. To frame it another way, Reyes made his major-league debut in early August of 2016 and by the end of that month he was in the rotation. More than two-and-a-half years later, his rookie status is still intact. This spring, Reyes' stuff, including his big fastball, has been in vintage form, and he's in the running for a relief role to start the season. Don't be surprised if Shildt starts off using him in pre-planned, one-inning stints and gradually shifts him into a less structured relief role. There's little doubt that Reyes can thrive out of the bullpen, assuming health. Health, though, is a big assumption. (Yes, for purposes of this particular discussion, this scribe is being rudely dismissive of the Pirates and Reds.) The margins are fairly tight, and that squares with expectations. The Cubs still have a core of Kris Bryant, Anthony Rizzo, and Javier Baez, and they still have that veteran rotation (perhaps too veteran, some would argue). The Cardinals, meantime, will this time around enjoy a full season under a Shildt and the thunder of Goldschmidt in the lineup. Right now, the system projects a Brewers-Cardinals Wild Card Game. Both, of course, are within hailing distance of the Cubs, so we could see another compelling three-way scrum. Set this prairie on fire, lads.